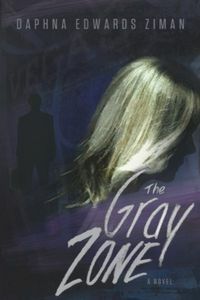 The Gray Zone by Daphna Edwards Ziman, a Mysterious Review. Review: When a nationally recognized politician is murdered in his Las Vegas hotel suite, the suspect is his secret lover, who has now disappeared. But the dead man's lawyer doesn't think she did it, even though the evidence is overwhelming, and sets out to prove her innocence in The Gray Zone, a stand-alone thriller by Daphna Edwards Ziman. Attorney Jake Brooks has only seen Kelly Jensen once … at least he thinks it was her, posing as Marilyn Monroe in a stage act on the night that Congressman Porter Garrett was murdered. Brooks wasn't even aware that Garrett was having an affair, but when Kelly's fingerprints are found at the scene of the crime, he remembers the look the impersonator gave him during her performance, and somehow just knows she didn't do it. But now Kelly has vanished, leaving no trail to for the police — or Brooks — to follow. Indeed, it isn't until Kelly stages a series of cleverly executed bank robberies but is captured that Brooks meets her as Kelly Jensen and agrees to defend her against all charges. The Gray Zone is roughly divided into two parts — a short third part acts primarily as an epilogue — with the first half being absolutely riveting. The tension level is high with considerable doubt in Jake's mind — and the reader's — as to who exactly Kelly Jensen is and what she's planning … for it is obvious she is planning something. She's a master of disguise, but to her it's more than just looking like someone, it's becoming that someone that makes her performances so effective. The cat-and-mouse game that plays out between Jake and Kelly during the first half is just about perfect for a thriller. The second half isn't quite as successful, with much of the edge that existed between the characters softened by the romantic attraction that Jake and Kelly feel towards each other once they meet in person. (A lot of the storyline unknowns, or at the very least uncertainties, are also revealed at about this point in the book as well.) They do make a formidable team in their pursuit of justice, though their actions seem to lack the originality and "planned" spontaneity that were the hallmarks of the first half. Still, this is a remarkable novel of suspense, one that will likely surprise a lot of readers, and is highly recommended. Acknowledgment: Greenleaf Book Group Press provided an ARC of The Gray Zone for this review.